Birmingham-based ATMS has launched its own Vehicle Mount Terminal, which is said to be unique in that it has an inbuilt battery and quick release bracket that allows it to be used as a hand held tablet PC. The VMT100 unit pictured has an 8.4 inch high brightness colour TFT screen. It runs the Windows CE 5.0 operating system, allowing it to run many software applications. An SD card slot is provided for long term data storage. The unit has inbuilt WiFi and Bluetooth communications. Two USB ports are available for connecting external devices such a keyboard, mouse, printer etc. Weighing just over 1kg and having a shock proof design allows it to be used easily outside the vehicle. A microphone and speaker are inbuilt for communications and potential voice applications. 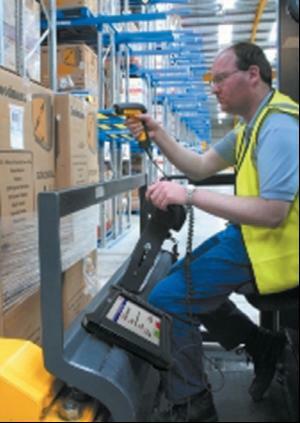 ATMS is targeting the device for warehousing and logistics, including for use on fork lift trucks.